We are always trying our best to raise well rounded, caring people in our kids and one thing we always try to do is give back to people who are less fortunate, people who don't wake up every morning to the kind of life we too often take for granted, especially around the holiday season. For a few years now, Kellogg's Rice Krispies has been helping us do just that with the #TreatsForToys campaign. If you don't know what Treats for Toys is all about, let me tell you; it's a really great initiative that only costs you a few ingredients and few minutes of your time (which if you are like me you will be spending on your family anyway), why not help others at the same time. All you have to do is purchase a box of holiday Kellogg's Rice Krispies and marshmallows, go home and create a Rice Krispies treat inspired by your kids favourite toys. Don't know how to make Rice Krispie squares? The recipe can be found on the top panel of the cereal box; you're welcome. This is fun and easy, something I've been enjoying doing with the kids in the past. Don't eat the creation right away, wait a minute! Take a picture of the glorious treat created and share it on social media using hashtag #TreatsForToys. This year they're even challenging you to create a moving part of your treat toy creation, something we were unable to accomplish but our treats still came out nice! Oh Christmas Tree, Oh yummy tree! For every creation shared, Rice Krispies will donate $20 to The Salvation Army to purchase a real toy for a child in need this Christmas. Make, share, give; those three simple words can help create lasting memories for a child to cherish for a lifetime. For more information about Kellogg's Rice Krispies and #TreatsForToys please visit treatsfortoys.ca! Our friends at Kellogg want you to participate in the Rice Krispies #TreatsForToys charity too! 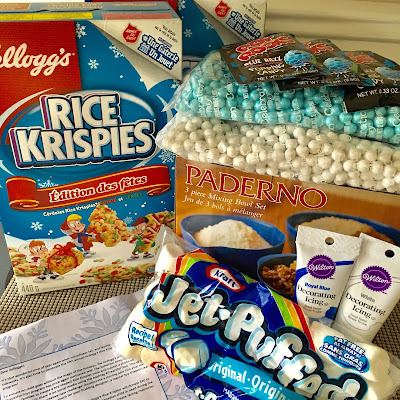 Enter for your chance to win a Kellogg's Rice Krispies Treats For Toys prize pack which includes everything you need to make your treats and decorate them! Kit includes 2 boxes of cereal, 1 bag of marshmallows, 2-2 lb bags of CANDY, 3 packs of Pop Rocks, 2 Icing tubes and a set of mixing bowls! Open to Canadians 18+ (excluding Quebec). Mandatory entry must be done for extras to count. One entry per household. Ends December 3rd, 2017. For more information about giveaways please see our disclosure page. Posted in participation with the Canadian Kellogger's blogger panel. Complimentary product received for participation purposes. Opinions and comments on this blog are those of the author. I would make Rice Krispies snowmen! Wreaths would be super cute! My 4 kiddos would love to get their aprons on and help make some treats. Their dad would love to sample their creations, too! We will make a tree with decorations! I will make snowmen with my grandkids. We would make rice Krispies snowflakes and have fun decorating them. My daughter would be my biggest helper! :) thanks! I will make a Santa face if I won. This is always fun. My son would help me and he would probably want to make a rice krispie winter wonderland!!! I would make some fun treats for my family. I probably wouldn`t have any helpers..lol,,only helpers to eat them! Probably a snowman, I might manage that. I would make snowflake krispies. I would make these with my niece. I would make Christmas ornaments with the grand kids. I would try to make a Christmas tree. My cousin would be my helper to make a teddy bear. I think I'll be making a race car with my son. My daughter would love to help me make a Christmas tree. My kids would be my helpers and they would make a tree, a teddy bear and a robot. I would make a Christmas tree with my niece. My little boy would be my helper and I know he would want to make a robot! Thanks! All my children will help me, and we'll probably make a princess doll. I am going to ask my daughter to help me and we will make a sleigh and then we will put candy in the sleigh! I would get my son to help and he says we would make a Pokemon lol! My 2 girls and I would make a Rice Krispie house! My sons would help me make a toy car. We will make a car and my son will be my helper. We would make a Christmas tree! I love your car and may just try one of those out, but I know she'd want a cat face too. We would make some christmas trees and my helpers would be my boys! My kids are into Lego bricks so we will be making a Lego village. I'd make a christmas tree with my niece! I'll make trains with my daughters. I will make boats and bears with my nieces! I would make a snowmen with my family. My daughter would love to help me make some snowmen. I will make a Christmas tree. I would make a boat. I will make a snowman, and Christmas tree with my grandson. I would make a little Christmas Tree with some presents and my little helpers would be my three children. I have two little boys who would help me build the best car! We will be making a dinosaur and enclosure and my son would be helping of course. I would make a Christmas tree with the help of my nephew's little girl. My 7 year old will be my helper and help me make blocks, then build a castle with them! i will make a snowman and my daughters will help me! My daughters would love to help me make Olaf and some snowmen friends!